It is becoming more and more commonplace to hear of athletes finally coming out. We've probably got a long way to go before we get closeted major league sports stars feeling comfortable enough to announce their sexuality to the world. I think, however we are approaching a tipping point. We are winning the values war, whether the religious right likes it or not! 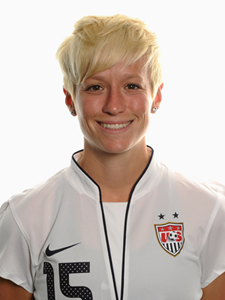 U.S. Olympic soccer player Megan Rapinoe is speaking frankly about her sexuality in a new interview with Out, telling the magazine that she is a lesbian and in a committed relationship with a woman. Rapinoe, who's been dating her girlfriend -- identified in the magazine only as an Australian soccer player -- for three years, also took time to chat about homophobia in sports and, more specifically, female athletes' perspective on the subject.